Normalt 4-10 dagers leveringstid, så lenge varen er på lager hos leverandør. 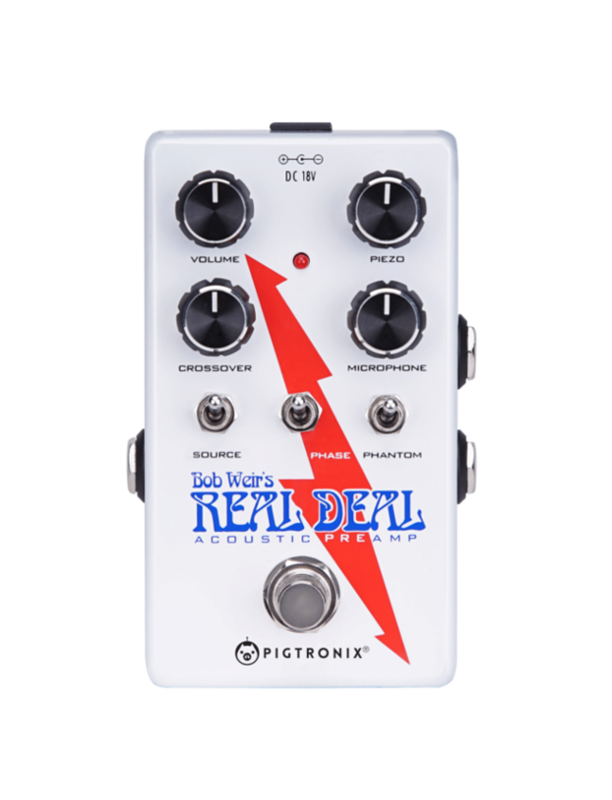 Bob Weir’s Real Deal acoustic preamp by Pigtronix provides crystal-clear, super-loud acoustic guitar tone while faithfully maintaining the organic wooden sound of the instrument like no other pedal has ever done. Bob Weir and long-time Grateful Dead tech guru and Weir’s personal Front of House engineer, Mike McGinn, developed the principle behind the Real Deal in an effort to crank Bob’s acoustic guitar loud enough in the live mix while retaining the natural, unplugged sound of the instrument. The technology they developed to achieve this goal involves using a pair of complimentary filters to split the acoustic guitar signal into low and high frequency bands, with independent preamp gain applied to each signal path. A mastering stage then combines the various inputs into a single mono output, resulting in a powerful world-class acoustic guitar tone. Bob Weir challenged Pigtronix to design a pedal to perform this unique type of processing using a low-noise, all-analog circuit, to deliver the ultimate live acoustic guitar sound. The engineering challenge involved with developing this pedal to create a realistic and amplified acoustic guitar sound in this way is no joke! First, the cutoff points of the two filters would need to be precisely matched and calibrated to avoid undesirable dips or bumps in the frequency response at the pedal’s output. Second, in order to optimize the acoustic sound from venue to venue and for each different guitar, the cutoff point where the two filters overlap also would need to be variable across a huge frequency range. As a solution, Pigtronix created a totally unique tracking filter. It allows the musician to adjust the cutoff point of both filters with a single knob, sweeping over a full decade of frequency range from 300 Hz to 3 kHz. This analog filter array—at the heart of the Bob Weir’s Real Deal acoustic preamp—uses Pigtronix custom-made optical components and 18VDC power to achieve the ultra-low noise and high headroom required when processing acoustic guitar. Bob Weir’s Real Deal acoustic preamp is universally compatible with any type of acoustic guitar pickup—from a simple, passive piezo element to complex active systems that use internal microphones, contact elements and/or magnetic pickups. A source switch determines whether the high and low bands are fed by independent sound elements (such as a mic and piezo installed in one guitar) or a single pickup that is then split and sent through both filters. Single-source mode has the additional benefit of allowing the Real Deal to be used to process the sound of an electric guitar or any other instrument. An additional TRS balanced input, equipped with switchable 48V phantom power, allows external microphones of all types to be incorporated as well. In presenting Bob Weir’s Real Deal acoustic preamp, Pigtronix is honored to make a contribution to Bob’s continuing legacy of sonic innovation. This legacy dates back to the late 1960s, when the Grateful Dead and their associates revolutionized the technology of live sound—re-defining the rock & roll concert experience. Over 50 years later, and in partnership with Pigtronix, Bob Weir is still innovating.